Jordan Houghton will have an eye on Mansfield Town's clash with Lincoln City on Monday night after MK Dons climbed back into third spot on Saturday. 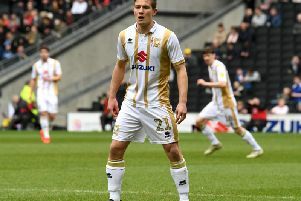 Chuks Aneke's 84th minute goal saw Dons come from behind at Stadium MK to draw 1-1 with Stevenage - a point earned according to manager Paul Tisdale. The result sees Dons climb back into third spot in League 2, jumping promotion rivals Mansfield who take on leaders Lincoln on Monday. Houghton, like Tisdale, was happy with a point against Stevenage, and said the pressure is now on Mansfield to get something against the side on top of the table. He said: "A point takes us into third, obviously a win would have been better, but we'll see what the game holds on Monday, hopefully it keeps us in third and we'll go from there. "It was a point gained. It was always going to be a tough game, they're a tough game and it was going to be a battle. "Going 1-0 down is always tricky, so we have to take the positive in that we've come back and finished really strongly. We might even be unlucky not to win it. Although we only had a handful of chances, we put them under real pressure and it's a little frustrating, but it's a point gained. Hopefully we will look back on this as a point gained." Having started the game in the centre of midfield, after covering for an injury-ravaged back line, Houghton was once again called upon to drop back into defence after Mathieu Baudry was withdrawn in a tactical move at half time, before Baily Cargill was stretched off in the second period. "It's not settled, but it's a part of the game," Houghton continued. "Tis always talks about having players that are versatile and it calls upon other players to move around. We've got a few injuries at the back but to be honest I don't mind where I play, as long as I'm on there."